Providing you on-going business and platform support. Most of the issues you’re likely to encounter will occur within the configuration layer. You have business-specific rules, pay rules, bank rules, etc. that can change over time. As well, you’ll need to keep technical and functional documents up to date. While your software vendor provides the technical support, our experts can keep your solution working at its most efficient and proactively address problems before they grow into major issues. 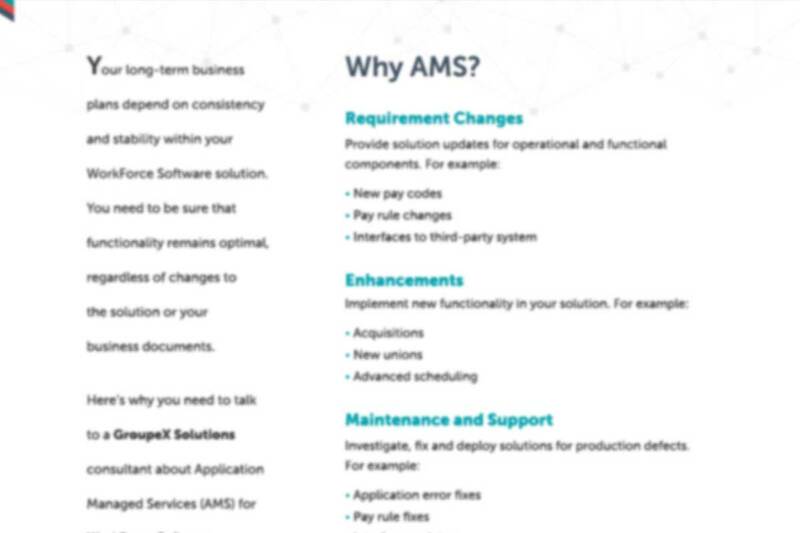 Our Application Managed Services (AMS) solutions are based on leading practices and designed to support your WorkForce Software solution needs, whatever they may be. Working together, we will investigate, fix and deploy solutions for production defects in the WorkForce Software solution. This can include: application error fixes, pay rule fixes, and interface updates. We can provide updates for operational and functional components, for example: new pay codes, pay rule changes, and interfaces to third-party systems. You may wish to implement new functionality in the product, for example: Advanced Scheduler. We can help you build a more robust solution as your business needs evolve.